The two maps I opted to use giving a playing area of 15 x 10 hexes. The Confederate forces will be deployed in around the small town on the left with the Union advancing on a broad front after having crossed the small river on the right. Before I describe the battle that I will be fighting as part of my ACW renaissance I wanted to post some pictures with the actual set up so that I could set the scene. If I am honest taking pictures under artificial light using the laminated Axis and Allies maps is a horrible experience as the glare is awful. This weekend was a challenge because it was so dank and overcast that I had to abandon the attempt to fight the action simply because photography was so difficult. My man cave has two roof windows that under normal weather conditions makes for a very light and airy space. However, because of the angle of the roof it means that the lights tend to funnel straight down rather than diffusing. This means that if using artificial light you have a very well lit area but at the cost of reflected glare on any shiny surface. Going forwards I will need to think about to reduce this so that the maps are more photograph friendly. The forces deployed for the start of the action. The Confederates also have an additional infantry unit and a cavalry regiment deployed to the rear as a reserve (see the next picture). The fieldworks can be clearly seen between the two small woods to the north and south of the town. 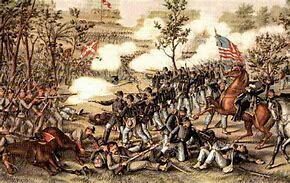 The Union forces have deployed for action from their marching order after having crossed the small river. 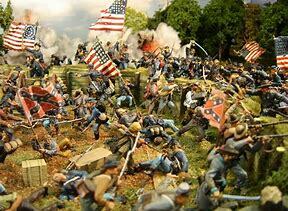 The full Confederate force. 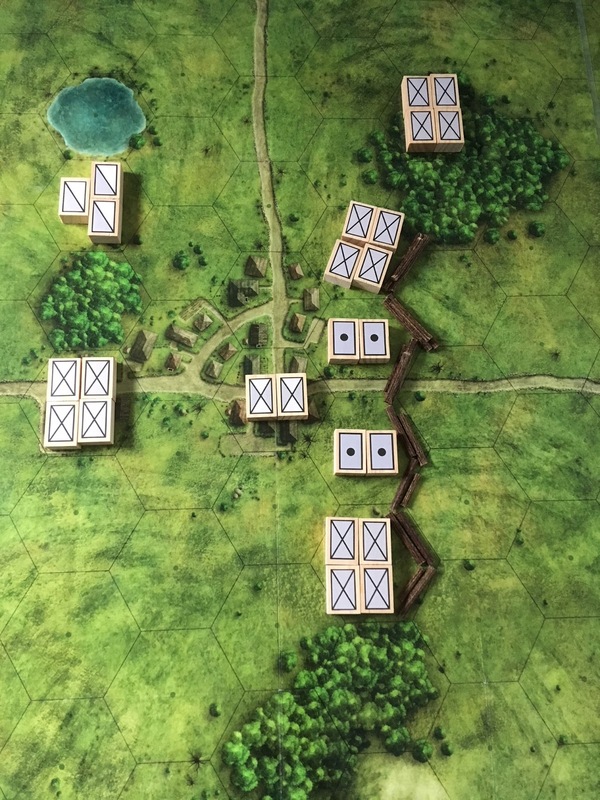 The artillery is deployed to have a wide field of fire and is not only fortified but has infantry on either flank as well as the woods. It is a good position but for the open ground north of the woods above the town and the hills (see the picture before the above) that dominate the town. The Union forces deployed on a wide frontage thereby giving them the option to favour either flank whilst pinning the main the Confederate position. Note the 3 point artillery units meaning that they have greater staying power than their Confederate counterparts. Whilst the Union forces outnumber those of the Confederates they certainly do not possess an overwhelming numerical advantage. They will need to be careful how they attack as they cannot afford to sustain too many casualties so they are really forced to seek a flank to exploit. The Union artillery could have a substantial impact on the outcome should it be able to secure the hills so the Confederates will need to mindful of this. The Confederates, given their numbers, have deployed sensibly and have prudently kept a small reserve to help counter any flanking attempts. Whether or not this will be sufficient remains to be seen. I have gone back to basics with the ACW and am treating it as a new period for me to game in - in reality it is most definitely not but I want to be a little more systematic in my approach this time around. With this in mind I am reading John Keegan's history of the war as an overall primer to set the scene. Battles and Leaders will serve to support the Keegan title for the finer detail in respect of the actions fought and indeed, will be used as a reference source. My interest will focus on the Western theatre as I am very interested in the campaigns including the rivers and swampy bayous - I have a selection of Peter Pig 1/600th models to assemble and paint for this - so I fully expect to be adding to the library in due course. My commuting companion at present - I have the hardback version - and I have to say it is a very good read. Given the thousands of publications about the ACW it would be very easy to throw cash at lots of things but I want to keep the collection fairly compact if I can. I tend to find this works better for me having a smaller library to refer to - my 1815 collection for example is under ten books. I shall look out for a good uniform reference and a couple of specific Western theatre histories, probably a couple of nautical themed volumes as well. Throw in the odd Osprey or two and there you have it. My throw away comment about going back to basics and being a little more systematic in my approach are valid points and for reasons that are actually quite embarrassing. 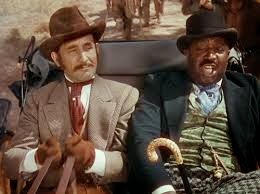 I wince at the thought of the amount of time and money I have wasted over the years on the ACW - from figures, rules, books and board games - all acquired and disposed of with dizzying rapidity. I want to make sure that this time it sticks - and why should that not be the case? It is, after all, a fascinating period, blessed with sufficient variety to appeal to even the most particular of gamers. As to figures I am currently not even thinking about this as it would be well down the running order with everything else I have underway. Using the block armies and the Axis and Allies maps is an immediately available option although I may look to figures at some point. The important thing is though is that I do not have to worry about this as the blocks are a perfectly acceptable alternative. If anything I am likely to tackle the ships first but again, there are a few other things higher up the to do list, the WW2 ships being the case in point. By approaching this in a methodical fashion I am hoping to ensure a degree of longevity with the period - just don't ask me to use Johnny Reb for a game! 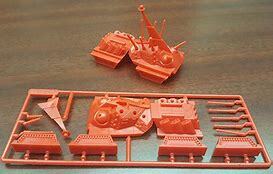 I posted recently about my acquisition of the newly released set of plastic models for Steve Jackson's Sci Fi game of cybertank warfare: OGRE. 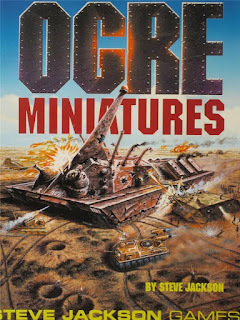 These models are the plastic versions of the metal models that were launched around the time of the release of the OGRE Miniatures table top rules way back in 1992. As I recall the miniatures rules for OGRE picked up a gong of some kind for being the best miniatures rules and they were certainly very good. You can pick up second hand copies from EBay or similar or you can get the rules as a digital version from Warehouse 23 which also includes some additional bits and pieces, an errata as well as a FAQ section. Coming back to the box set of models (which look even better now I have had the chance to really take a look at the) you also get a playsheet for OGRE, a couple of record cards for the OGRES themselves and a special edition D6. What I missed the first time round was the fact that the playsheet refers to the OGRE miniatures table top game rather than the boardgame. A selection of OGRE Miniatures deployed in their boardgame guise. The play sheet is headed up as OGRE Miniatures Lite - essentially the basic rules using the models in the box set. All measurements are in inches but combat is the same as the board game. I owned a copy of the full edition of the miniatures rules some time ago but no longer have them. A quick digital download from Warehouse 23 will put this right however and at a very good price. One of the things that struck me with the play sheet was the very short ranges employed which means that players are forced to get 'up close and personal' to secure a victory - none of this sitting on the baseline and lobbing missiles at each other although missiles do feature. There is a rationale for this in the designers notes from the miniatures rule book which I will need to take a look at. I am rather pleased at this turn of events as it will mean that the models can be used on a conventional table top rather than solely with hexes - which I planned to do anyway. It also means that I can justify getting some rather nice looking Sci Fi terrain, buildings and similar. This is a self contained project that can be slotted in as and when needed so at present there is no rush. The recent rediscovery of the Axis and Allies maps has been a real bonus for me for the various projects I have planned. Obviously the first thoughts I had extended to WW2 and the ACW but to my mind there is no reason why they should not be equally useful for anything from 1700 onwards. Certainly the Napoleonic Wars and the AWI are two that spring to mind as well. 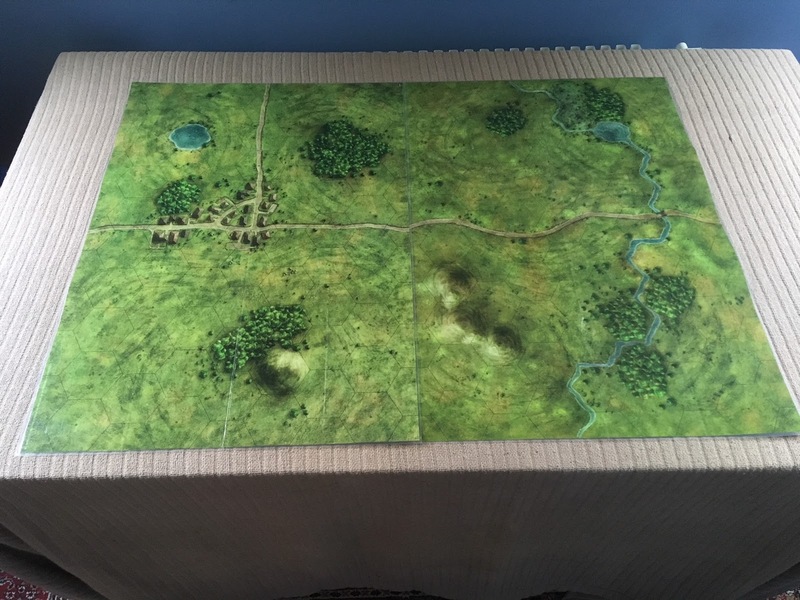 I did a little research into the original Axis and Allies game and found some PDFs of extra terrain types that can be used as overlays. That is fine but I was thinking more along the lines of some MDF hexes. I priced some of these up at Warbases and came up with a prices of £1.20 for 5 which is pretty reasonable. I was thinking along the lines of making 3D hills, woods and villages to either be used instead of the printed hex on the map or as freestanding pieces. Then of course there is also the Rafm Hex Transfers mentioned in an earlier post Alternatives to Hexon and Heroscape that I will also make use of. If I am honest for what I want to game the 3” hex is a better proposition for me as opposed to anything larger it is more space efficient. I rather like the idea of using free standing terrain hexes so I shall need to order a few in to experiment with. Originally I had considered using the hex transfers on a cloth but I am now thinking that using a hard painted surface may be a better idea. Putting together two pairs of boards – one for the desert and one for Eastern/Western Europe – should not be too difficult and would have the advantage of being easily storable. I am quite pleased with the variety of options I have for my hexed playing areas but more importantly using the maps means that I have the wherewithal to be able to set games up quickly and, as can be seen above, that look visually attractive. Sometime ago Wizards of the Coast produced a collectible miniatures game themed around land combat during WW2. The game was supported by a range of figures and equipment over several expansions and covered most forces and theatres of the Second World War. Needless to say I ‘dabbled’ in this - the models were scaled at 15mm give or take - but eventually disposed of the bits and pieces over a period of a couple of years or so. I did however, hang on to the maps that came with the game and one of the expansions. There were two double sided and geomorphic terrain maps in each of the two sets I had - meaning 8 maps in total. The hexes are 3” across the flat sides and each map has a 7 by 10 hex grid. As you will see from the pictures the two sets of maps are artistically different so using them together is probably not an option I would use. This means that I will have two double sided maps that can be used individually or combined in quite a few permutations for games. I have in fact used them before back in the very early days of the block armies and they look surprisingly good. I added some terrain pieces to bring the map to ‘life’ and this made quite a difference to the look of the thing. The only drawback is that whilst I had the maps laminated - they were paper so would not have lasted long - the laminate used is a high gloss finish which makes photography rather challenging under artificial light. The maps cover a a variety of rural terrain types and are suitably generic so could cover anything from the 18th century onwards. 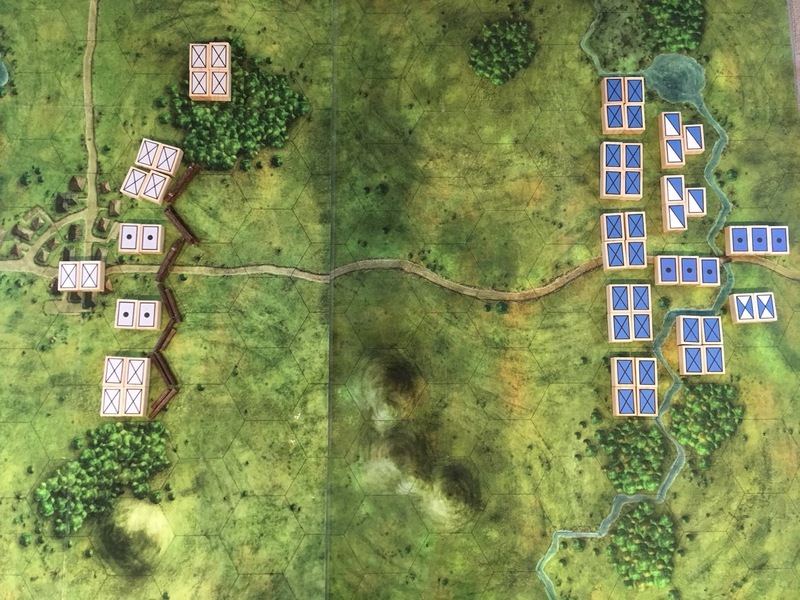 This is really useful for me and so the plan is to fight games either on the 7 x 10 single map or larger actions on a double sized map - typically a 14 x 10 although you could also deploy the maps end to end. The first four pictures are the two maps that came from (I think) an expansion. You can see the difference in the artwork. I rather like this one for some WW2 'defend the village' style actions. A nice spot for an ambush perhaps? These are the maps that came (I think) with the original game. I prefer this set from the artistic perspective. I must confess to preferring the artwork of this set - it seems a lot more natural. I am thinking that these have a lot of potential from the perspective of the Portable Wargame and certainly they would be useful for any number of periods. At this stage the ACW looks a likely candidate but looking forward there are a couple of other things that spring to mind. I will also use them for WW2 for both fronts - East and West - with the Axis and Allies 1/300th kit where I think they will work very well. I am glad I hung on these and I am sure I will get a lot of use from them in their second iteration. Picked up at Salute and a valuable resource for my plans. I mentioned in my last post about the WW2 land side and how best I would be tackling it. The main rules I shall be using are Rommel, Battlegroup and of course the Portable Wargame. The one thing I did not mention though is what I would be gaming as effectively there are two scales in play. I have been thinking about this a lot and so have decided that Rommel - which will using a 1/300th and 1/600th fusion of models - will be used for actions set in the late war, either Western or Eastern front. 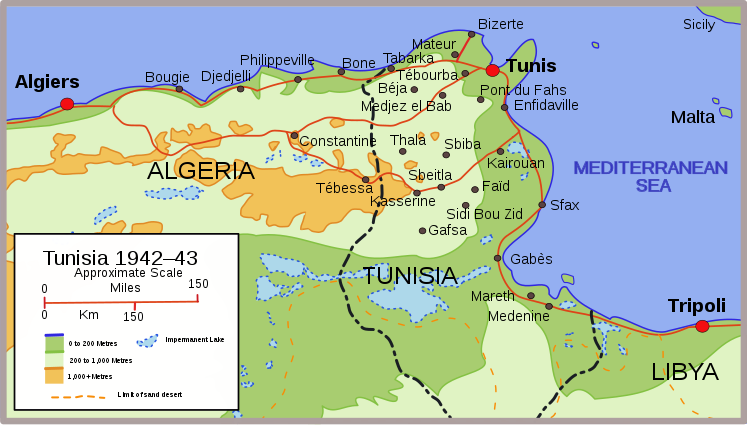 Battlegroup however, will be used for the desert via Tunisia. 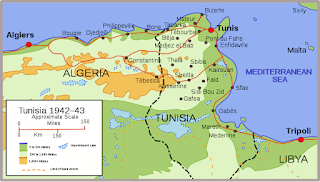 My reasons for choosing Tunisia for the Battlegroup option rather than the earlier period in the desert are many but certainly one of the main ones being because I can add the Americans in to the usual mix of British/Commonwealth, German and Italian forces. There is also a very good selection of kits available for all sides and it also means I can use the infantry figures from Axis and Allies (of which I have a huge number!). The theatre of operations - seapower played a decisive part in the outcome of the campaign. The Tunisian Campaign has a lot of potential for me in terms of gaming and the variety of kit in use and so I am confident it will provide me with plenty of things to think about when I get to it. Following on from my post of yesterday I planned to spend some time yesterday evening sorting through the bits and pieces I have for the WW2 and ACW projects to get a little clarity around how I shall be doing what I will be doing so to speak. Thanks to a three hour train journey home (plastic sheeting on the overhead power lines) and having to sort out some hassles with SWMBO's phone I was not able to get anything meaningful done. The situation I find myself in at present in respect of the project list is not an onerous one by any means but it does need some thought and planning. I am happy to use the block armies on a gridded playing area for the foreseeable future. I may get some figures painted for this but this is so far in the future that I am not even thinking about it! In any event I have no idea as to what scale figures I would use. The naval side is limited to painting the models and deciding what rules to use. This will feature sooner rather than later but not until I have squared away some WW2 bits and pieces. Taken as a whole then I am quite happy with the ACW and how it fits into my overall scheme of things. The critical point is that I have the wherewithal to fight some games using the block armies straight off the bat so to speak. If pushed I could drip feed some ACW ship painting into the mix but my preference would be to tackle the 40 odd models as a complete project rather than doing small pieces at odd times. The ships will come first and my plans to draft a set of rules to use with them have been parked. as it currently stands the British and Germans will be tackled first followed by the Italians (I have yet to get these at the time of writing). The Pacific fleets will follow but I have no timetable for when. The aerial dimension will be tackled at some point but I am unsure when this will be. It is rather a large project in any event and so is likely to be broken down into theatre specific chunks. This is a small and self-contained project that can be slotted in where needed. I have a small quantity of 'Mechs awaiting attention but again, they would be very easy to slot in as required. Again, I am planning on these being fairly self-contained and low level in terms of figures needed. I am unsure what scale I shall be using and I have a few novel ideas I am toying with as to what to use. No hurry with this but I would like to think I would be looking seriously at these by the end of the year. There is a saying along the lines of 'no plan survives beyond the first contact with the enemy' or something similar. This is true but I find it really helpful to at least have some kind of a framework to work to. The list above is quite helpful in that the 'chunks' are relatively bite-sized and so for me quite manageable. There is plenty of variety and options to explore which is very important when one is so easily distracted. If I can stick with the first two on the list in the way I plan to tackle them I will certainly get a number of things dealt with but more importantly, I will be able to get some games in again. 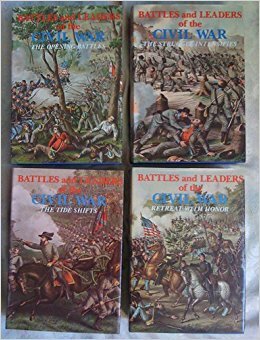 I spent an enjoyable evening yesterday thumbing through the recently acquired four volumes of Battles and Leaders as well as revisiting the box of Peter Pig ACW ship models I have. I have everything I need for this part of the ACW project – even scenery – so have little or no excuse for not tackling it (and offering up a silent prayer of thanks that I still have them in my collection) but my main focus is the WW2 project. 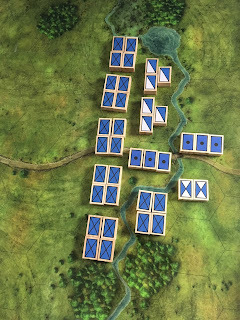 There are even some new rules for the period by the indefatigable Dave Manley that I may take a look at – they are designed to be fast play and there is also a campaign system to boot. There is plenty of scope within the period for some interesting games and with the campaign option as well it is even more attractive. I suspect though that land based games will feature first of all using the block armies and my Heroscape terrain. 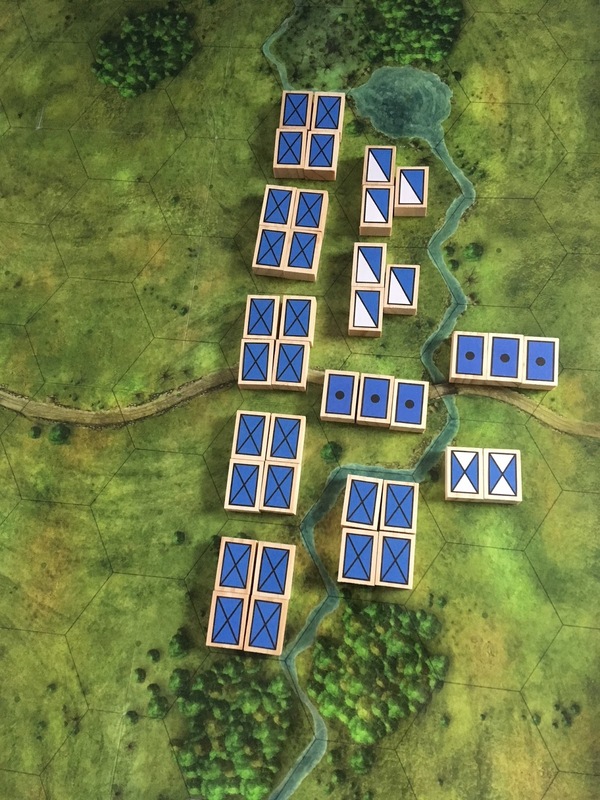 I can lift scenarios straight from the Battle Cry rulebook in the short term but Battles and Leaders will provide plenty of smaller actions to tackle. As I now have some storage on the ground floor I may relocate some of my gaming collection for this – namely the blue and grey blocks, the terrain, some Heroscape tiles and my dice/marker box. I already have a foldaway table of 3ft by 2ft which will be more than sufficient to set up a 13 x 9 Command and Colours playing area using Heroscape tiles. I could even knock up a Portable Wargame board with 2” squares if needed. Either of those options would work well although I will need to represent units with single blocks rather than using the famous 4, 3 and 2 approach. I have done this in the past and marked hits using the counters from a travel version of the game Othello. These are black one side and white the other. The white side represents a single hit and the black is two. An infantry unit with two hits suffered would have two white counters and a third hit would flip one over to its black side so that it would be showing one white and one back counter. Luckily the counters are small enough to sit happily on the blocks. I have used this method before and it looks fine. In the short term then my wargames world looks something like this. I am painting WW2 warships for naval gaming but intend fighting land battles set in the ACW using blocks. I have the land side to consider for Rommel/Battlegroup WW2 and then the ships for the ACW. To add to this I have the OGRE miniatures (very self-contained) and also Congo/The Men Who Would be Kings. On the face of it that is a fairly modest list but the big advantage is that there is sufficient variety contained therein to stop me getting bored. For me this looks hellishly reasonable and even, dare I say it, relatively achievable. A project tipping point - more scenarios than one could shake a 1861 Springfield Rifled Musket at! In my last post I mentioned that I had been after a set of Battles and Leaders for some time. This is true up to a point. I wanted a set ages ago and then decided - somewhat rashly as it turns out - that I was severing my ties with the ACW entirely. So I did. All of the books I had acquired as well as the models and boardgames were all disposed of and so the Blue and the Grey had disappeared from my consciousness. I have enjoyed a love/hate relationship with the ACW over the years (mainly due to some horrible rule sets that prompted my somewhat hasty disposals) but have grown to realise (again) that as a wargames period it offers much to commend it. It is well supported with books, rules, figures and board games to start with and so getting into the period would be very easy. It could be tackled as cheaply or as expensively as required and most importantly offers a large variety of challenging scenarios to game. Critically though, it includes viable combined arms style operations along the rivers and coastline. Scratchbuilt models of the USS Essex and CSS Arkansas trade blows - the latter came second and was duly sunk. As the Union forces advanced so the USS Carondelet and the Essex attempt to engage the Fort Duvet on the Blueberry Bend. Back in the early days of this blog - when I was going through my ACW 'love' phase as opposed to the 'hate' version - I embarked on a massive scratchbuilding program to churn out some ACW ships for use on the rivers and swampy bayous in conjunction with the block armies and actually fought some very good games using them with Attack on Fort Duvet, 1862 being a good example (God was that really 5 years ago?!). Whilst the ships have gone (and have been replaced with Peter Pig 1/600th models) the block armies have remained. For a variety of reasons though I am unlikely to tackle the second half of the 19th century from a European perspective - my interest in the continent effectively ends in 1815 (even allowing for the Russo-Turkish War) - but I am interested in warfare during the period. I could tackle colonial small wars stuff for sure (and fully intend doing so - hence Congo and The Men Who Would Be Kings) but the war that ticks most of my boxes in respect of scale and scope is therefore, by a process of elimination, the ACW. The wars in South America could have offered an alternative but for some reason do not engage me in quite the same way as the war between the states. 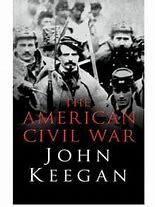 I came to this conclusion over a period of about 18 months and so at the end of last year I made my first tentative foray back into the period by acquiring a copy of John Keegan's book on the American Civil War as a primer. I still had a selection of Peter Pig ACW ships and a pile of their 3mm troop blocks (very nearly disposed of in the 'cull'), not to mention their Hammerin' Iron riverine naval rules so that would represent a start. For the land side I am thinking that the wooden block armies will suffice to begin with although I would like to tackle some figures at some point - this would be a long way off though. As it stands then I have the models for the naval side, metal troop blocks for the armies should I wish and the ready to use wooden block armies. I could fight land battles immediately if I wished which is ironic in that the WW2 project is front and centre of my efforts at present. Painting the ships would make for a nice change from the WW2 stuff if required though. So what of Battles and Leaders then? Well, from the minor flirting with the ACW once again occasioned by John Keegan's book my surprise acquisition of the above series courtesy of Dave Lanchester at Salute has moved the ACW back in from the shadows to sit along side the WW2 project. This will serve initially as an alternative period for when my notoriously short attention span starts flagging and a distraction is needed. Without a doubt the inspiration Battles and Leaders will provide is immeasurable and so I am sure it will generate many ideas. I never expected to be coming home with this collection from a wargames show but now that I have I am glad that I have - I am sure it will spur me on to accord the period the attention it deserves - I am a sucker for historical accounts from participants et al as they really add to the flavour of what one is trying to game in my opinion. At the very least it will serve as a reminder of why I should game this period rather than be put off by mere sets of rules. Well I have finally done it. I have been to Salute at the Excel. By virtue of the fact I was helping Dave Lanchester set up his stall (although most of the work had been done of Friday afternoon) I arrived at the Excel a little after 7am. I was carrying two heavy bags full of books and so Daves’ book stall seemed to be miles away from the car park - not only that I did not have a map of the venue (I must have been the only person in the Western Hemisphere that did not!) so it was hugely fortunate that Dave and Lynne arrived at the entrance at the same moment I did. Our transaction was speedily concluded (more of which later) and the final touches to the setting up was completed fairly quickly and so I was free to have a wander around before the fun started. I was able to take part in the annual bloggers meet up - my first - and so it was great fun talking to Bob Cordery, Tamsin Piper, Big Lee, One Lover Ray and Posty (of reject fame) not to mention Dave from Suffolk and Carl from Hitting on a Double 1 (and I now know why he used that title for his blog!). Apologies to any I may have missed out. I had a chat with Andy Callan about bargain wargames - using Jenga blocks (a subject dear to my heart) and Axis and Allies miniatures, not to mention Risk figures and assorted odds and ends. It was nice to talk about using items other than models with a kindred spirit. Peter Dennis arrived and so the conversation turned to the quite outstanding paper soldiers being used and featuring in a number of publications. They are something I may well investigate. I also had a long chat with Dan Mersey (of Lion/Dragon Rampant, The Men Who Would be Kings and others) who was demonstrating a forthcoming Richard Borg Command and Colours deep space combat game called Red Alert. The Plastic Soldier Company will be launching this on kickstarter soon and it looks a cracker. I mentioned that I did not take many pictures of games so hear is a selection of those that I did. An action set in Italy featuring a convent and rampaging Garibaldists. Chris Hardman and Messrs. Francis and Weston set this one up and very nice it looked as well. 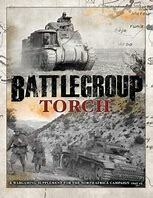 Plastic Soldier Company put on the above game to coincide with the launch of Battlegroup Torch - the latest supplement in the Battlegroup series covering North Africa up to the fall of Tunisia. I did not get he chance to credit the clubs in question for the games above for which I apologise but anyone that has a show guide could probably find out! As far as the Salute loot was concerned (the Sa-loot of the title) I was able get that which I wanted, that which I had been after for some time and finally, something that I had half a hankering for that appeared, as if by magic and at a great price. From the top Battles and Leaders, The War in East Africa, some Tumbling Dice 1/600th figures and a single City gunboat from Peter Pig. Battlegroup Torch with a complementary 1/72nd scale Stuart/Honey (this was part of the shopping plan) and finally a copy of Congo - skirmishes set in the Heart of Africa or rather as we would imagine them to be so suitable for anything along the lines of King Soloman’s Mines or similar. I am planning something ‘Battlegroup’ related at some point and the desert will be my first choice in a larger scale. I would be able to make use of the infantry from my Axis and Allies collections. Throw in a few kits and we are good to go. Congo is something I have been pondering for a while as it is something a little different and not too figure intensive. The rules feature some stunning Foundry figures in use (actually that is where I got them from) but I am thinking again about 20mm. Having said that I reckon that the sets available from Foundry would also make good forces for The Men Who Would be Kings. Something to think about for the future anyway. Summing it all up then I would say I had a great day. For sure it was tiring and I hurt in places I forgot I had but meeting up with friends old and new as well as the chance to see some quite stunning games and to tackle the all important retail therapy Salute certainly ticked all the boxes. 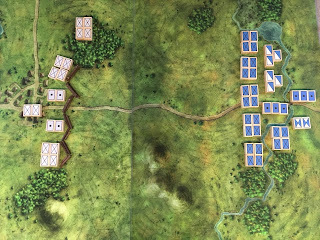 Way back in the middle of last year I posted the following blog entry - 1/600th Thoughts and the Portable Wargame. At the time I was messing around with the Perry Travel Battle set and the Tumbling Dice 1/600th scale troops produced in support of their extensive range of aircraft. Aside from the fact that my 'ideas' have moved on quite a lot since then I had rather neglected both of the above. As a result of the recent man cave reorganisation the figures found themselves in close proximity to the Axis and Allies vehicle pile and I suddenly realised that there was an answer to a question I had not even asked! The Tumbling Dice 1/600th infantry look pretty good alongside the Axis and Allies vehicles and so in one fell swoop I have solved the thorny question of how I was going to tackle this - or rather what I was going to tackle this with. I like the Tumbling Dice figures as they are really generic and can be used for just about any nation you want. In fact, I would go so far as to say they could readily be used for the Horse, Musket and Rifle era if you were not too picky on the details. I need to plan this in a little more detail and I certainly do not have enough figures for the grand scheme of things but I reckon this is a good idea - and it would certainly look better than using the blocks alongside the vehicles. But what of your WW2 naval project that assured everyone was coming first and had priority over everything else? I have not hit a buffer with this although progress has not been anything like as fast as I would have liked. I shall be tackling the models but the rules will be shelved for the time being for a very simple reason. Bob Cordery recently returned from a cruise and during the trip was a busy chap indeed. In fact, to use his own words it was A Productive Fortnight. With what currently has up his sleeve I have decided to hang fire with my own naval rule efforts as I am thinking that his plans to go up to 1920 will give me plenty of scope to extend them to 1945. This is of course entirely a personal thing but as I have often said (and has been proven by others on many occasions) the core mechanisms of the entire Portable Wargame concept are so sound that any amount of tinkering can be undertaken without destroying the spirit of the rules. It also means that I would be able to seamlessly Portable Wargame WW2 not only on land and in the air but also at sea. 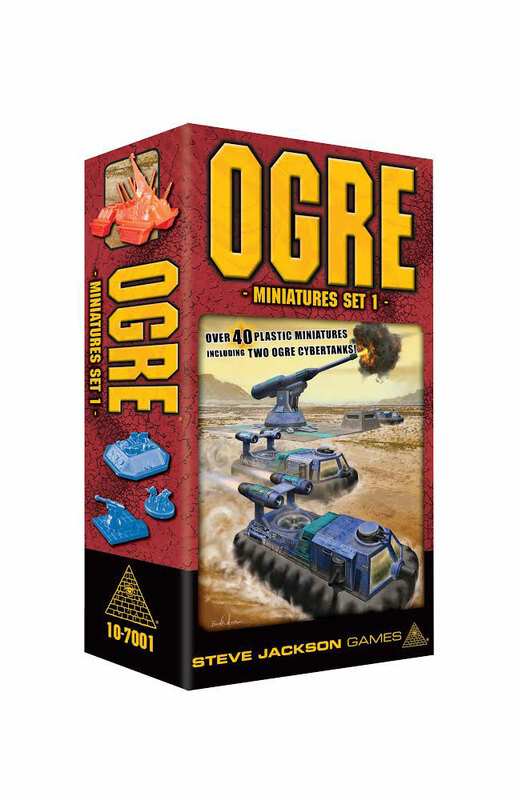 I have always enjoyed the Sci Fi game of OGRE by Steve Jackson. Ever since it first came out (along with the companion/expansion game G.E.V) as a small budget price game contained in a box not much larger than a smart phone it has followed me around. For those that are unfamiliar with OGRE it is a very simple game in which the basic, classic scenario pits a single OGRE against a variety of opposition unit types. The victory conditions are very simple - the OGRE player has to destroy the enemy command post whilst the defenders have to stop the OGRE. The OGRE is a self aware cyber tank armed like a battleship and able to engage multiple targets. The defenders have an array of power armoured infantry, heavy tanks, missile tanks, howitzers and G.E.V. 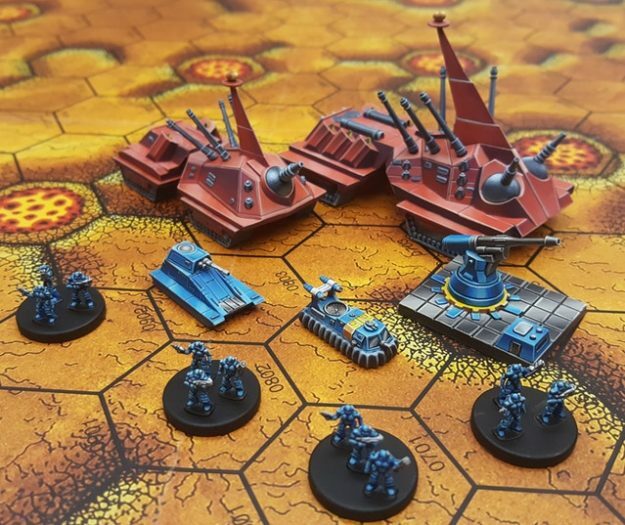 There have been a number of versions of the game and also some miniatures rules to support the metal models that were available to support them. These now command some high prices and so when Steve Jackson games launched a kick starter project to release the models in plastic I was highly delighted. I did not take part in the kick start project (I did not need to as it was funded very early on) but have finally gotten around to acquiring a set of the miniatures - and very nice they are indeed! The classic OGRE - this is the Mark V version and is scaled for (roughly) 1/285th and comes in 9cm long! OGRE is played on a hexed grid and whilst I have the current version of the game with the 3D card OGRE models (and very nice they look as well) I always wanted to tackle the game using models Given the size of the playing are used it would not be practical to use a hex that the models fit on - I am thinking Hexon here - so I am planning to use Hersoscape tiles to model the classis OGRE battlefield. Although the OGRE model above would take up two hexes Steve Jackson has already addressed this problem very early on in the games' history. Essentially the OGRE only occupies the leading hex and so all measurements for movement and firing are directed there. Using Hexon would be an option but it would take up too much room in the man cave so a smaller option would the preferred choice. As you can see from the picture below this is very much in the desert, post nuclear apocalyptic style of terrain so constructing something similar would also be useful for my planned WW2 desert adventures. The classic OGRE battlefield. 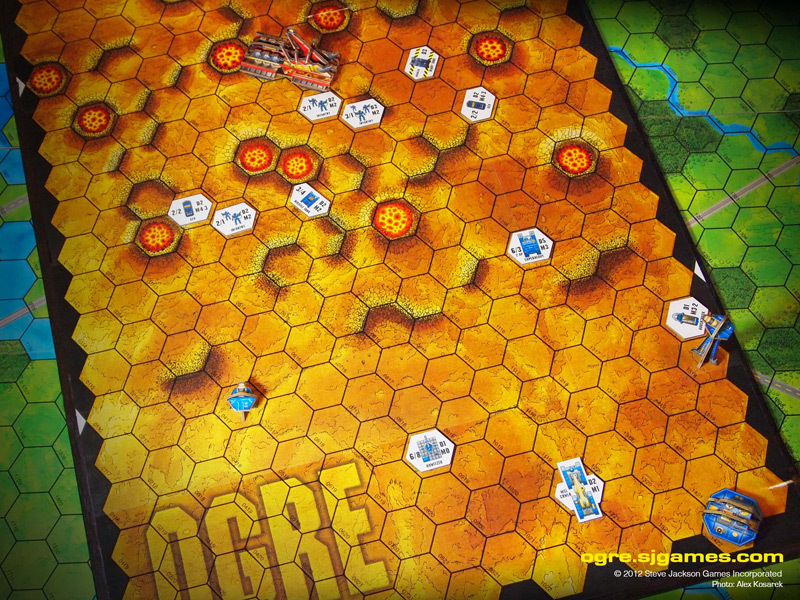 Later editions of the game included other terrain types - usually (as I recall) as an overlay. 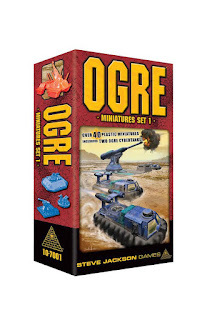 The box set of miniatures are of course usable for other Sci Fi based games and I do not expect them to be solely used for OGRE. I will acquire the second set and can see myself buying more of them but for now I will content myself with what I have - and very nice it is as well. Sadly that does not refer to any of my gaming projects - rather it is the grand bedroom swap that has been underway for the last three weekends. I will not bore you with all the details but suffice it to say weekend one was buying all the material required and starting the furniture merry-go-round. Weekend two - the Easter long weekend - was the preparation, filling and decorating and finally, the weekend just gone, saw the newly acquired Ikea units assembled, the rooms organised the new occupants settling in. Basically my son and daughter have swapped rooms and as a result of this I have gained a new table and an additional shelf for my storage units in the man cave whilst losing a small cupboard. I am pleased we have finished it all and so it means I can get back to something like normality - especially some gaming related items that I simply have not had the time to do. Mention of the small cupboard I lost and the table I gained in the man cave is quite significant because the cupboard (which is now in son's bedroom) has now taken quite of bit of 'stuff' out of its sister unit downstairs - the contents of which were my grandsons (it was his toy cupboard for when he visits). This means that I can move some of my modelling/painting kit downstairs so it is far more readily available. The table I gained for the man cave will replace the 3ft by 2ft fold up table that I was using as a painting station but it was really a little on the small side. the foldable table will be relocated downstairs and used when needed for painting. I am really pleased about the final outcome of all this household manoeuvring as I can, at last, get on with some stuff without having to decamp to the loft (domestic harmony of course being all important....). The man cave will of course continue to be the main point of storage for my stuff and the solo games I will be fighting. Way back in September of last year I acquired a copy of Rommel by Sam Mustafa. These are a grid-based operational level set of WW2 rules. At the time I was thinking about 3mm using the models produced by Tumbling Dice (of which I have supply lurking in the man cave) and half sized squares (in the rules they use 6" squares so a 6ft by 4ft table will be 8 x 12) - mainly because I already have some boards gridded up using 3" squares for my Portable Wargames. Fast forward some six months (gosh, that went quickly!) and I am now knee deep in my Axis and Allies WW2 project that has given me rather a lot of 1:300th -1:285th scale tanks and artillery. These are quite basic and generic looking models (and by generic I mean that, for example, the Sherman looks like a Sherman but you would struggle to pin it down to a specific mark of that iconic tank) but they would work very nicely with Rommel using the smaller playing area. I have yet to decide about infantry as originally for the Portable Wargame style games I envisaged using the appropriate units from my block armies but for Rommel figures would look better. I have a vast number of 20mm Axis and Allies 20mm figures that I want to use so may well dip into them. Given the scale of the actions fought using Rommel a lot of low level detail is abstracted and this extends to equipment and weaponry. I have absolutely no problem with this and so using the Axis and Allies Boardgame pieces, as well as those available from Historical Boardgaming, means that I can get extra mileage out of the models above and beyond my planned Portable Wargame adventures. 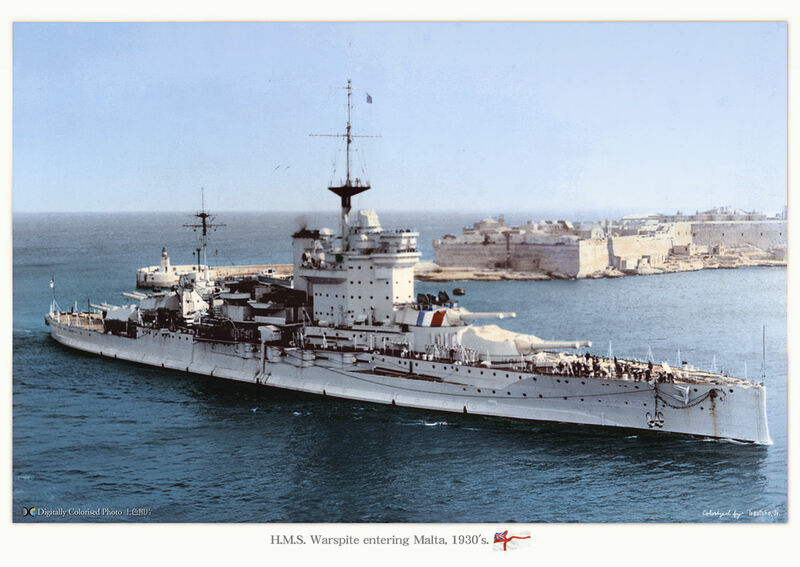 HMS Warspite from the Axis and Allies Pacific 2nd Edition game. I have to say that I am very impressed with the service from Historical Boardgaming as the order I placed with them last week has arrived this morning! If you recall I wanted to add some additional ships to the Royal Navy and the Kriegsmarine, simply because the available range from the various editions of Axis and Allies is very limited. I will be honest I was a little apprehensive about how the Historical Boardgame original pieces would compare with the Axis and Allies types but I needn't have worried, they are fine alongside each other and will mix in quite happily. I would say that the Historical Boardgaming pieces are probably more detailed but not outlandishly so. The plastic used can best be described as a rigid polythene - very similar to that used in the pieces from the game Power by Spears Games - so will take painting and basing readily enough. I noticed that a couple of the KGVs have a little warp in the hull but I suspect that is nothing the old 'hot water bending technique' could not fix. In any event I am only planning to use 3 out of the 5 models. 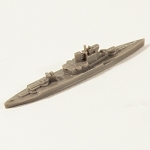 The tribal class destroyer is a nice model as is HMS Warspite - both of these are from the Axis and Allies Pacific game and are used to represent the ANZAC forces. The S class destroyer I already have and so the RN will have eight of each. The sole German destroyer is a Type 1934 Maas class although Historical Boardgaming do feature a Narvik class should I fancy some of them. The biggest omission from the Axis and Allies ship range is that there are no light cruisers. 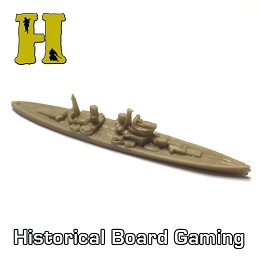 Historical Boardgaming include a few but surprisingly none for the Royal Navy. I may look to do something about this in due course but for now I have sufficient material to give a number of interesting games. One of the things that occurred to me was the option of using commercially available ranges to cover those ships not currently available. If there is something that I desperately need I could go down that route I suppose but if I am honest it kind of defeats the object of what I am attempting to do - namely produce a WW2 gaming set up using the contents from boardgames. I now have all that I need to tackle the Royal Navy and the Kriegsmarine so no more excuses - on with the painting! ....And finish the rules naturally!